Many who’ve tried it find that children take naturally to the imaginative aspects of roleplaying games. Daniel Solis has an idea for a game—more in the style of joint story-telling than GM-led adventure—and is looking for sponsors. 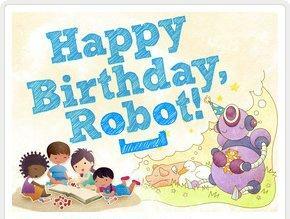 With Happy Birthday Robot, players will roll dice and take turns to make up silly stories about the robot. The parents were, for the most part, quite supportive. Those that were not only expressed concerns due to religious reasons. I have been able to document, with information given to me by several of the teachers and parents, that almost 60% of the active participants in the gaming club have actually improved in problem-solving skills and reading comprehension since starting with us. With such great results, the group has grown to 36 kids and the school is dedicating a section of its library to games. The younger children play mostly Bakugan, while the older ones are playing a lot of RPGs, including D&D and GURPS, but also Warhammer 40K, Stratego, and Magic: The Gathering. The thing is, Brian’s been supplying all these games from his own pocket, and as participation grows, he needs help. Check his web site to contribute to the Kids Need to Game program. Great News Update: Fundraising for Happy Birthday Robot is going so well that Daniel has worked out an arrangement to donate copies to Kids Need to Game. Well hot dang! Thanks so much for posting about Happy Birthday, Robot! I’m really enthusiastic about the project and I’m happy to see other people are too. I can’t believe we’re so close to the fundraising goal in just the first day. After we meet the goal, people can still pre-order a $30 PDF+Print bundle (that covers shipping and handling too, even on international orders). You can also order just the PDFs with a $10 pledge. Thanks so much for the mention, David! It is really generous of you to help spread the word!